So last week I talked about the Ex Libris reading journal and the smaller, unnamed journals pictured above. Today I will take a look at the Pocket Pal diary and the Manufactus leather journal. David got this through his work; Lou Lines is a customer of theirs. It’s a Pocket Pal diary for 2016 made by Myron Corp. The cover is a heavy vinyl with a brushed suede feel. It’s the perfect size to fit in a bag or briefcase: 6″ x 3.5″. The first page has spots for personal details but on the left is a small notepad with detachable pages. It is a weekly planner, with not a lot of space but enough for a few appointments or things to remember. As long as you don’t do too much on the weekends LOL. But it is aimed at the business community so I will forgive it for the lack of space on weekends. Each page has a small monthly calendar and an inspirational quote. All major international holidays are noted. It has the standard information pages like Birthdays/Anniversaries, Toll Free Numbers and Time Zones but what makes this little planner stand out for me are the unique information pages that are actually useful and entertaining, like Texting Acronyms and Keyboard Shortcuts for Microsoft Word and Excel. I did not know that ZOMG was just Oh My Gosh with emphasis. These keyboard shortcuts are actually quite useful and there were more than a few that were new to me. Every planner should have these! And the First Aid pages are great; always just at your fingertips. Overall a great little planner. The paper is standard but that’s ok; the compact size and the thoughtful extras make this planner appealing. Not sure what I will use it for but I had to share because it’s so cute and has more info than certain super expensive planners I could name. Then we come to the Manufactus leather journal. What a surprise this was! My friend gave it to me and it is beyond beautiful. The leather feels so soft and buttery, it’s just heaven. It smells divine and the paper is a dream too. So spoiled! The leather is dark brown and slightly textured. The tag says Made in Italy and they are available at Chapters. The best part – it’s refillable! This cover and I will never be parted. Sigh. I love how the inside cover has an extra pocket for notes. The right side of the flap is covered in a suede-like material. And the 5.5″ x 7″ journal nestles in the middle. It is lined and has a brown bookmark that matches the colour of the leather. 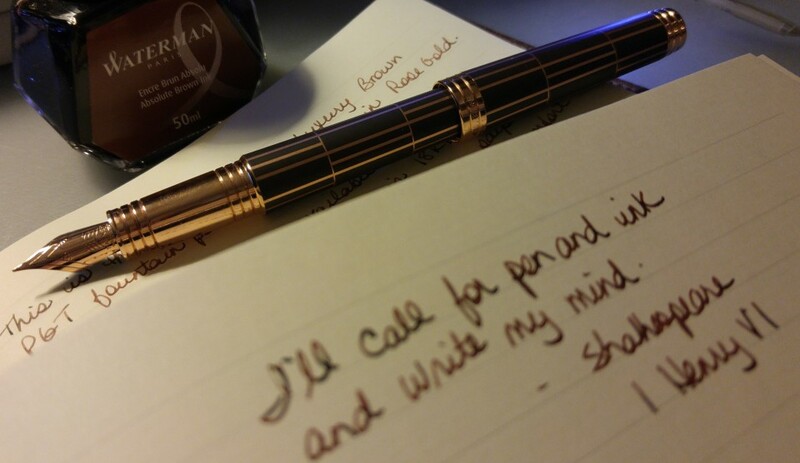 I did a quick ink/writing text and the paper takes fountain ink beautifully! The paper is thick and creamy, just a little off-white. No bleed-through and virtually no show-through. I cannot wait to add this to my rotation of journals. I’m almost finished my Winnable Executive Journal and I think this one might be next in line. It’s almost at the “too beautiful to write in” level – who am I kidding, it totally is – but I resolved long ago to not let that stop me from writing in a beautiful journal, from experiencing it first hand. So yeah this one just might be the next everyday journal. Such a wonderful gift; thank you Sarah! So that’s it for another year. I put away most of my Christmas decorations today, while looking out the window at the snow softly falling. The turning of another year. As the temperature falls and my boots crunch the snow beneath my feet, I celebrate the winter slumber and stillness, and think of the promise of spring. It really is beautiful. And yes Sarah is the best!